CARBONDALE — The Rainbow Cafe LGBT Youth Center is hosting a community art show in late April. 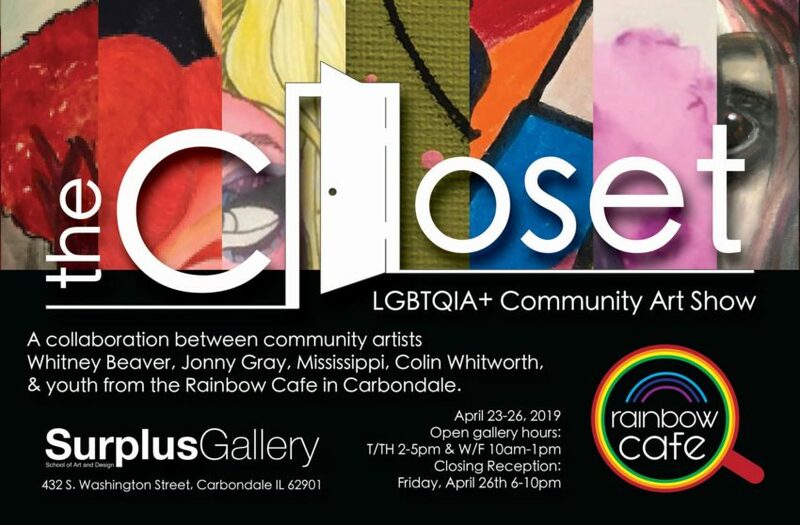 THE CLOSET: LGBTQIA+ COMMUNITY ART SHOW will feature anonymous LGBTQIA+ youth artists as well as 5 community artists Colin Whitworth, Jonny Gray, Whitney Beaver, Emily Sands, and A.B. Performanceart. Over the past several months, these artists partnered with Rainbow Café and held workshops and demonstrations to help foster the creativity and skills of R.C. youth. The artworks created through this process will be published in the next edition of the Rainbow Café Youth Art-Zine THE CLOSET and are featured in an exhibition in the Surplus Gallery that will culminate in a gallery reception/fundraiser that will benefit Rainbow Café. The show will be at the Siu Surplus Gallery at 432 S. Washington in Carbondale.